When Taylor Hack joined a RE/MAX brokerage in 2013, he was recently licensed and launching a new career. Experienced in the mortgage and auto industries, he thought his skill set would serve him well in the real estate business. In choosing a company, Hack wanted the advantages of a leading brand, a global network, a collaborative environment, a sky’s-the-limit mentality and a forward-thinking culture. He found it all at RE/MAX—and, specifically, at RE/MAX River City in Edmonton, Alberta. Fast-forward to 2017, and Hack’s career is flourishing. His results have climbed in each of the past three years, and he’s already a member of the RE/MAX Hall of Fame and Titan Club. Innovation is a prevalent theme at all levels of the RE/MAX network. It’s demonstrated by the entrepreneurial, full-time agents and brokers. It’s part of the organization’s global vision. It’s evident in aggressive digital and social marketing strategies. It’s apparent in disruptive business expansions such as Motto Mortgage, which launched in October 2016. And it’s a clear priority for corporate leaders. The spirit of constant innovation has helped lift RE/MAX to its status as one of the industry’s elite brands. In addition to being the only network to top 1 million U.S. transaction sides last year, RE/MAX is No. 1 in brand name awareness (according to an MMR Strategy Group study of unaided brand awareness) and has a global footprint unmatched in the industry, with a presence in more than 100 countries and territories. The power of the brand is most evident in the industry-leading productivity of its agents. In the 2017 RISMedia Power Broker Report on the nation’s largest brokerages, RE/MAX agents averaged 16.2 transaction sides each—a figure more than double the 7.5 average of all other agents in the survey. Productivity is a major edge in a fiercely competitive industry, especially when an agent is competing for the business of a quality-conscious buyer or seller. The result when professionals like that come together is that nobody in the world sells more real estate than RE/MAX, based on closed residential transactions. With five consecutive years of growth in agent count, the global real estate leader has no intention of slowing down. In fact, a recent change will add to the network’s momentum. 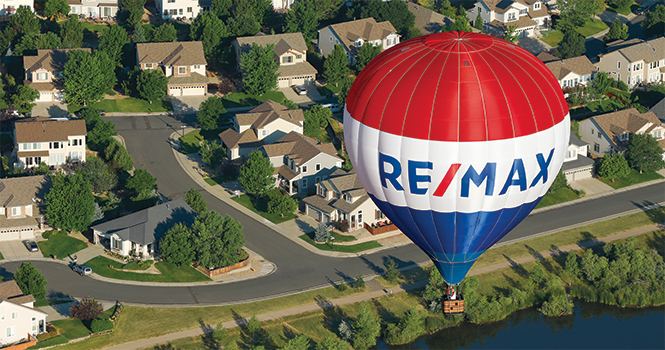 A RE/MAX “brand refresh,” revealed at the 2017 RE/MAX Broker Owner Conference in August, impacts all visual aspects of the brand—from yard signs and office signs to logos, and even the iconic RE/MAX Balloon itself. The refresh is a natural, evolutionary step that helps great brands stay current and relevant with customers, preferences and delivery channels, Contos adds. The strategic, data-driven process took nearly two years and incorporated the opinions of more than 20,000 consumers. Jennifer Atkisson-Lovett, a Hall of Fame broker/owner with RE/MAX of Stuart in Stuart, Fla., was all-in on the designs from the moment she saw them. Brad Whitehouse, co-broker/owner of the multi-office RE/MAX Professionals in metro Denver, is equally enthusiastic. Importantly, the refresh was developed from a position of strength. Leaders have emphasized that it’s “an evolution, not a revolution.” The intent was to enhance and modernize the brand, not change its identity. Whitehouse sees the refresh as a natural step for a forward-thinking brand. When the leaders at RE/MAX see a new opportunity for broker/owners, agents and clients, they act quickly. That’s part of their no-limit mentality­—and the brilliance of a top brand willing and able to evolve. So in October 2016, RE/MAX Holdings, Inc. launched its newest industry disruptor and the second member of its family of brands: Motto Mortgage. The complementary business provides a way for an owner of a real estate brokerage to provide a one-stop solution, via a Motto Mortgage franchise, for both homebuyers and borrowers. The broker operates two completely separate businesses—generally within steps of each other—in which real estate agents help find clients the right house, and loan originators work with multiple wholesale lenders to help secure financing. The concept is simple: Focus on transparency and compliance, anticipate the wants and needs of consumers, and simplify the process. It’s yet another innovation from a company renowned for embracing new concepts. Several RE/MAX brokers are among the first Motto Mortgage owners. RE/MAX has long been home to experienced agents; a place where agents come after learning the ropes elsewhere. When they felt ready for the big time, they’d make the leap. Currently, RE/MAX agents in the U.S. average 15.2 years in the industry, and 8.6 years with RE/MAX. But in the past few years, more newcomers are seeing RE/MAX as a smart place to begin their careers. Passionate, driven and confident, they’re embracing the productive, collaborative environment in RE/MAX offices throughout the network. Take Corey Casper of Texas, for example. A millennial now in his mid-20s, Casper served in the U.S. Army for five years before joining RE/MAX 1 in Cedar Park, Texas, in 2013. Casper’s life took a turn when a friend suggested real estate might be a good option for him. Casper hasn’t looked back since. He’s become a successful agent with a thriving career. No longer a “nice-to-have,” a comprehensive social media campaign and digital strategy are an essential “must have” for any modern marketing plan. RE/MAX, LLC is an active player in the social and digital space, with effective behind-the-scenes and consumer-facing programs that benefit agents, offices and the brand as a whole. Social: Having a social presence and not staying on top of it is worse than not having a social presence at all. RE/MAX makes it easy for agents to post regularly. The “We Are RE/MAX” Facebook page offers a steady stream of professionally produced social graphics, consumer tips, videos and other resources. Agents enjoy similar support on Instagram, LinkedIn and even Snapchat. Digital: By analyzing trends and other signals, RE/MAX digital initiatives reveal where a customer may be in the buying/selling process, so agents can then reach out with tailored messaging. Personalized ads for specific circumstances go a long way in furthering the conversation, building trust and establishing connections. The process lays the groundwork for lifetime business relationships that go far beyond a single home sale or purchase. Social: RE/MAX, LLC—in collaboration with the award-winning Camp + King creative agency—is constantly innovating on social media. A new social portal at remaxhustle.com enables RE/MAX agents to socially connect with consumers in fun, engaging ways. A few examples: They can present customized, digital “Welcome Mats” to new homebuyers, and they can provide real estate tips through a system called “First Flight.” Huge impact. No cost. Tiny investment of time. Digital: The comprehensive digital media plan includes search, display, retargeting, video, content, social advertising, app prospecting, and more. RE/MAX digs deep into data to pinpoint how different marketing efforts impact brand awareness, lead generation and agent results. One initiative involves data-crunching techniques for audience segmentation, with resulting messages tailored to individual demographic, interest group or population segments. RE/MAX has even partnered with BuzzFeed to create content specifically for millennial and Gen X consumers. The RE/MAX online presence attracts millions of visitors and generates an average of 3,000 referral-fee-free leads sent to RE/MAX agents every day. A convenient way to browse properties on mobile devices. Agents can brand the app with their own information. RE/MAX offers a series of free, turnkey sites provided to agents and offices. Modern, robust and completely customizable, sites are available specifically for agents, teams, offices and multi-office brokerages.